The Planetary Science Decadal Survey is now well underway as the community discusses how NASA should spend its money in the discipline over the decade from 2013 to 2023. 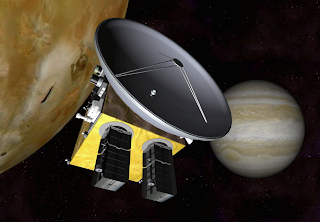 For the outer planets, the previous decadal survey made a Pluto flyby mission and a Jupiter atmospheric orbiter two of its main priorities. These mandates later morphed into the New Horizons and Juno missions. At this point in the process this go around, various groups in the community are producing white papers, documents that provide details as to what should be the priorities over the next decade for their subject, be it technology, planetary astronomy, Titan, Europa, or Io, for example. NASA's Outer Planets Assessment Group (OPAG) website has several drafts for some of these white papers, including the latest draft of the Io white paper. Additional submitted white papers can be found on the decadal survey website (check out some of the ones at the bottom of that page for a laugh). The Io white paper being authored by Dave Williams from ASU with many others, including myself, in the Io community providing input. The paper is split up into two parts: Part 1 discusses why exploring Io should be important to the rest of the community and what kinds of science goals are needed for a future mission to the satellite; Part 2 explores the types of missions that should be sent to Io in the next decade and beyond. 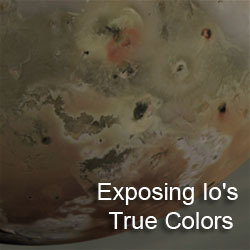 These recommendations highlight the need to study Io's time-variable phenomena and to close the gaps in temporal coverage of Io's volcanic activity, whether it be using Jupiter-system missions (dedicated to Io or not) or Earth-based telescopes. As Jupiter and Earth reached their closest approach for 2009 (also known as opposition when the Earth is between Jupiter and the Sun), Christopher Go captured a number of excellent views of Jupiter and its major satellites over the weekend with his telescope in the Philippines. 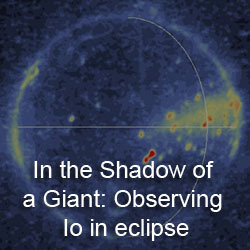 Included in these images was an eclipse on Ganymede caused by the shadow of Io crossing the larger satellite's surface. This is the opposite of what I've been talking about for much of the summer, where the shadow of Ganymede crossed Io's surface. 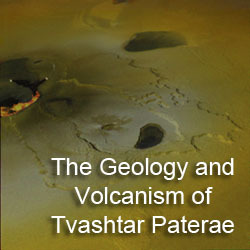 The animated gif of the incredible imaging sequence is presented at right. Don't forget to check out the rest of Christopher Go's Jupiter images on his website.